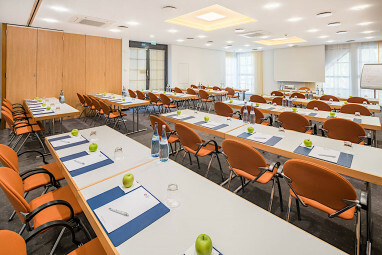 Homepage > Hotels in Nürtingen > Best Western Plus Hotel Am S.
The 4-star Best Western Plus Hotel Am Schlossberg is located between Stuttgart and the Swabian Alps in the center of the historical Hölderlin town of Nürtingen ( only 15km from the new Stuttgart Trade Fair Centre and the airport). Due to that location the hotel is a perferct starting point for tours and trips through the region. Feel the magic of castles, beautyful old towns like Tübingen, Esslingen, Bad Urach... and natural spectacles of the Swabian Alps. 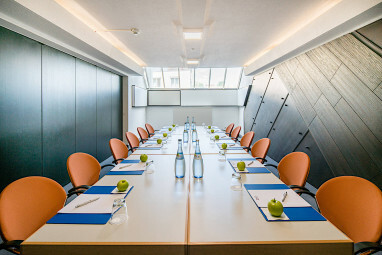 Hold a meeting and build a team in 16 conference rooms with a capacity for up to 430 people. 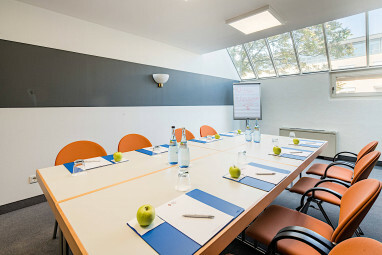 Our conference rooms offer the perfect frame for every occasion, private or business. 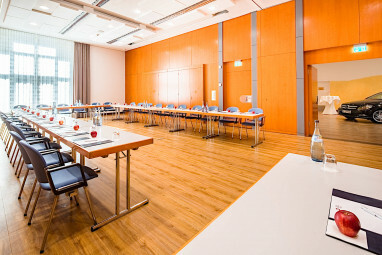 Swabian and international cuisine is offered in our three restaurants. Each restaurant has its own special atmosphere, come in and enjoy it. At our wellness area Olympic Park healthiness, relaxation and fitness are in the first place. We invite you to spend a little holiday during your stay. 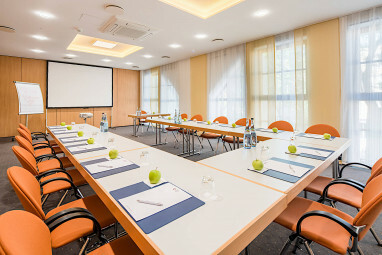 We offer our guests 163 well-appointed rooms with Bathroom with bathtub, air conditioning, minibar, Pay TV, Wi-Fi, room safe, non-smoking rooms, Windows for opening and Allergy-free room. In our rustic bar heiligs Blechle regional specialities or a draught beer await you while the Restaurant Schupfnudl offers international and regional dishes to suit every taste. 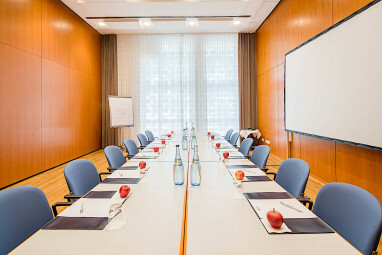 16 conference rooms for up to 450 persons offer best atmosphere for successful meetings. Each room has daylight , can be darkened and they are all air-conditioned. 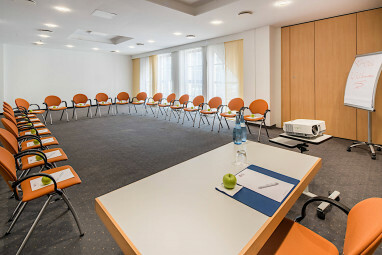 The rooms can be enlarged or made smaller by flexible room figuration.For exhibitions and welcomes we like to put our spacious foyer at your disposal. 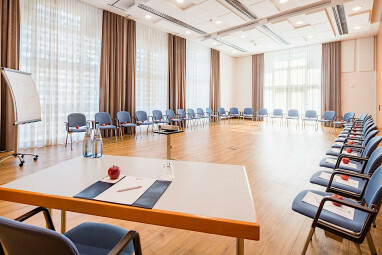 Our conference assistant will help you to guarantee the success of your conference. 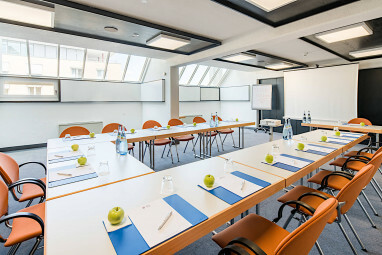 Simple conferences are not exciting enough for you? If you would like to support team spirit or motivation of your group we are surely pleased to help you and inform you about our great incentive offers. 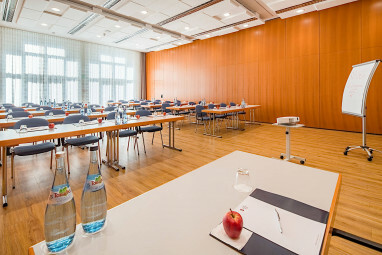 For congresses and big events there is a congress center "K3N", which is located only 300 meters from the hotel. • Use of our recreation area "Olympic Park" with swimming pool, sauna, steam bath etc. 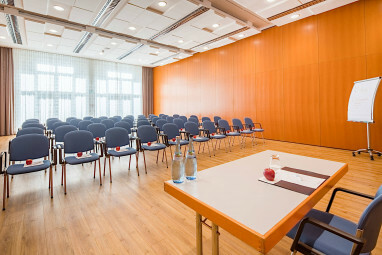 Of course we are willing to offer an individual price quote for conference series. Would you like to offer something rare to your employees? Would you like to support team spirit and motivation of your colleagues? We compiled great ideas for you! From appealing culture events to adventuress climbing sessions and exciting detective work. You will certainly find a great and eccentric event for your team. If you have further questions we are of course willing to help you and we will compile an offer without obligation. The main focus of this unit is an exercise which takes 60 seconds as well as relaxation and extension exercises accompanied by modern music. This program can be performed in business suit. Feel the big effect of such a little fitness device! 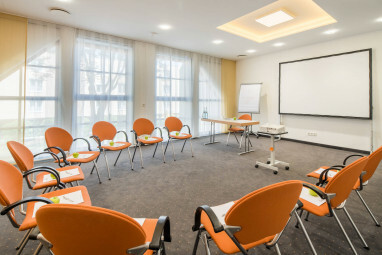 You will learn exercises which you may perform without any problems directly at your place of work . The aim is to innervate your muscels of your back effectively. It is possible to print your logo of the workshop or company onto the bands. The bands can be given away after the training. The main focus of this unit is an exercise with coloured juggle foulards. Coordination, communication as well as teamwork are demanded. The participants will learn quickly to juggle with more than two foulards and this makes it exciting. They will learn playfully how to handle several things at the same time. Coming from Karlsruhe, Stuttgart or Munich along Highway A8: Take exit Wendlingen/Nürtingen to B313 leading to Nürtingen. Drive straight on direction Nürtingen and “Nürtingen/Zentrum“. Take left on the 2nd traffic light. Please follow the street till the second traffic light.There you have to turn right. After about 600m there is another traffic light next to the railway station. Please turn also rightand you will be on the Eruopastraße. After about 300 Meters you will see the hotel on the left side. is located within a 15 km distance. By car drive to the B313, then take the A8 to Stuttgart / Karlsruhe. Exit “Leinfelden-Echterdingen / Flughafen“ can be reached within 15 minutes, if there are no traffic jams. 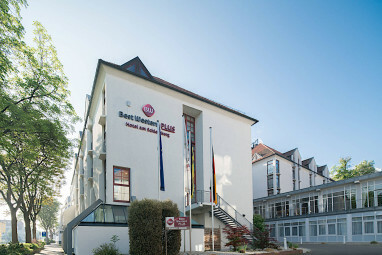 Busses to the airport leave the bus station in Nürtingen (distance to the hotel 200 m) every few hours. Certainly the airport can be reached by train as well. Take the “RegionalExpress“ to Plochingen, then take the “S-Bahn“ (rapid transit railway) to the airport. The next IC station is located in Plochingen. The station can be reached within 10 minutes by train. On the expressway it is a 12 km distance. Main station Stuttgart has best connections to various destinations. By train the station can be reached within 30 minutes. S-Bahn (rapid transit railway) The “S-Bahn“ departs from Plochingen to destinations like Stuttgart, Herrenberg and Waiblingen.